자궁내막암(子宮內膜癌, endometrial cancer)은 자궁내막에서 발생하는 암이다. 폐경기 이후의 여성 중 질 출혈이 전체 자궁내막암 사례 중 90%에 해당한다. 출혈 이외의 증상은 흔하지 않습니다. 다른 증상으로는 폐경기 여성에서 얇은 흰색 또는 깨끗한 질 분비물이 있다. 자궁내막암의 위험 요인에는 비만, 당뇨병, 유방암, 타목시펜의 복용, 임신의 무경험, 늦게 찾아온 폐경기, 높은 에스트로겐 수치, 노화가 있다. 유전적으로 자궁 내막 암의 가족력이있는 여성은 더 위험하다. 자궁내막암의 진단은 건강 진단 및 자궁 조직의 절제(D&C)를 통해 수행된다. 그 뒤 이 조직은 암의 진단을 위해 조직학적으로 검사된다. 암이 발견되면 의학 영상을 수행하여 암이 확산되고 있는지, 조직을 침범했는지를 확인한다. IIIC2 대동맥주위 림프절의 수반. 골반 결절이 있을 수도 있고 없을 수도 있다. 자궁 내막 암의 주요 치료법은 수술이다. 자궁 내막 암 환자의 90 %는 수술을 받는다. 외과 적 치료는 전형적으로 양측의 자궁 절제술 (난소 난소 절제술)과 난소 및 나팔관을 포함하는 자궁 적출술로 이루어진다. 조직학 등급 II 이상의 종양의 경우 림프절 절제술, 또는 골반 및 대동맥 박리 림프절의 제거가 수행된다. 림프절 절제술은 미국에서 자궁 내막 암의 모든 단계에 대해 일상적으로 수행되지만 영국에서는 림프절이 일반적으로 II 기 이상으로 만 제거된다. 림프절 절제술의 주제와 1 단계 질병에서 생존율 이점에 대한 논의가 아직 진행 중이다. 3 기 및 4 기 암에서 cytoreductive surgery(세포감퇴수술)가 일반적이며, 망막의 생검도 포함될 수 있다. 원격 전이가있는 병기 IV에서 수술은 완화 치료의 일부로 사용할 수 있다. 개복술, 개방 복부 절차는 전통적인 외과 수술이다. 그러나 [복강경 검사법] (열쇠 구멍 수술)은 수술 중 이환율이 낮다. 두 가지 절차는 전반적인 생존율에 차이가 없다. 질을 통한 자궁 절제에 비해 복부를 통한 자궁 절제술이 권장된다. 왜냐하면 자궁 절제술의 [복막 세척 | 세차]를 검사하고 얻을 기회가 있기 때문이다. 복강 내로 암의 추가 증거를 발견 할 수 있다. 암 병기는 수술 중 수행된다. 몇몇 수술을 하면 안되는 이유에는 수술 불가능한 종양, 과도한 비만, 그리고 임신을 원하는 경우가 있다. 이러한 금기 사항은 약 5 ~ 10 %의 경우에서 발생한다. 임신을 원하고 저등급 1 기 암을 가진 여성은 타목시펜 치료와 병행하여 또는 동시에 프로제스틴으로 치료할 수 있다. 이 치료는 암이 치료에 반응하지 않거나 가임 될 때까지 계속 될 수 있다. [자궁 천공]이 D & C 나 자궁 내막 생검에서 발생할 수 있다. 자궁 내막 암을 제거하기위한 수술의 부작용으로는 성기능 장애, 일시적인 요실금, 그리고 [림프부종]과 함께 변비를 포함한 수술의 일반적인 부작용이 있다. 적절한 치료를 수행했을 때의 자궁내막염의 5년 생존률은 80%이다. 70% 이상의 대부분의 여성은 FIGO 병기 I의 암에 해당하며 가장 좋은 예후를 보인다. 병기 III, 특히 병기 IV의 암은 더 악화된 예후를 보이지만 이들은 상대적으로 희귀한 편으로, 전체 사례 중 13% 정도에 불과하다. 초기 병기의 자궁매악암의 재발률은 일차적 치료를 하였는지, 보조 요법을 하였는지에 따라 3~17%에 이른다. 대부분의 재발률(75~80%)은 골반 밖에서 발생하며 대부분은 치료한지 2~3년이 지나 재발하는데, 2년이 지난 뒤에는 64%, 3년이 지난 뒤에는 87%에 이른다. 2014년 기준으로, 해마다 전 세계 약 320,000명의 여성이 자궁내막암으로 진단을 받으며 76,000명이 사망하는데, 이는 여성에게 흔히 발생하는 암들 가운데 6번째에 해당한다. 자궁내막암은 암이 주기적임에도 불구하고 대중들에게 잘 알려져 있지 않다. 증상에 대한 인지가 낮으며 나중에 진단을 받은 다음 생존 확률이 악화되는 경우가 있다. ↑ “General Information About Endometrial Cancer”. National Cancer Institute. 2014년 4월 22일. 2014년 9월 3일에 확인함. ↑ Kong, A; Johnson, N; Kitchener, HC; Lawrie, TA (2012년 4월 18일). “Adjuvant radiotherapy for stage I endometrial cancer.”. 《The Cochrane database of systematic reviews》 4: CD003916. PMID 22513918. doi:10.1002/14651858.CD003916.pub4. ↑ Reynolds, RK; Loar III, PV (2010). 〈Gynecology〉. Doherty, GM. 《Current Diagnosis & Treatment: Surgery》 13판. McGraw-Hill. ISBN 978-0-07-163515-8. ↑ 가 나 Saso, S; Chatterjee, J; Georgiou, E; Ditri, AM; Smith, JR; Ghaem-Maghami, S (2011). “Endometrial cancer”. 《BMJ》 343: d3954–d3954. PMID 21734165. doi:10.1136/bmj.d3954. ↑ 가 나 다 Galaal, K; Al Moundhri, M; Bryant, A; Lopes, AD; Lawrie, TA (2014년 5월 15일). “Adjuvant chemotherapy for advanced endometrial cancer.”. 《The Cochrane database of systematic reviews》 5: CD010681. PMID 24832785. doi:10.1002/14651858.CD010681.pub2. ↑ 가 나 “What You Need To Know: Endometrial Cancer”. 《NCI》. National Cancer Institute. 2014년 8월 8일에 원본 문서에서 보존된 문서. 6 August 2014에 확인함. ↑ 가 나 International Agency for Research on Cancer (2014). 《World Cancer Report 2014》. World Health Organization. Chapter 5.12. ISBN 978-92-832-0429-9. ↑ Suh, DH; Kim, JW; Kang, S; Kim, HJ; Lee, KH (2014). “Major clinical research advances in gynecologic cancer in 2013”. 《Journal of Gynecologic Oncology》 25 (3): 236–248. PMC 4102743. PMID 25045437. doi:10.3802/jgo.2014.25.3.236. ↑ “Stage Information for Endometrial Cancer”. National Cancer Institute. 2014년 4월 23일에 확인함. ↑ Vale, CL; Tierney, J; Bull, SJ; Symonds, PR (2012년 8월 15일). 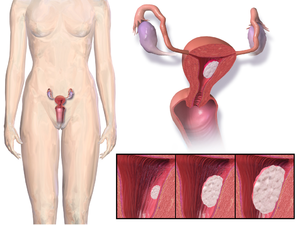 “Chemotherapy for advanced, recurrent or metastatic endometrial carcinoma.”. 《The Cochrane database of systematic reviews》 8: CD003915. PMID 22895938. doi:10.1002/14651858.CD003915.pub4. ↑ 가 나 다 Colombo, N; Preti, E; Landoni, F; Carinelli, S; Colombo, A; Marini, C; Sessa, C (October 2013). “Endometrial cancer: ESMO Clinical Practice Guidelines for diagnosis, treatment and follow-up”. 《Annals of Oncology》. 24 Suppl 6: vi33–8. PMID 24078661. doi:10.1093/annonc/mdt353. ↑ 가 나 Galaal, K; Bryant, A; Fisher, AD; Al-Khaduri, M; Kew, F; Lopes, AD (2012년 9월 12일). “Laparoscopy versus laparotomy for the management of early stage endometrial cancer.”. 《The Cochrane database of systematic reviews》 9: CD006655. PMID 22972096. doi:10.1002/14651858.CD006655.pub2. ↑ 가 나 Hoffman, BL; Schorge, JO; Schaffer, JI; Halvorson, LM; Bradshaw, KD; Cunningham, FG, 편집. (2012). 〈Endometrial Cancer〉. 《Williams Gynecology》 2판. McGraw-Hill. 829쪽. ISBN 978-0-07-171672-7. 4 January 2014에 보존된 문서. ↑ Hoffman, BL; Schorge, JO; Schaffer, JI; Halvorson, LM; Bradshaw, KD; Cunningham, FG, 편집. (2012). 〈Endometrial Cancer〉. 《Williams Gynecology》 2판. McGraw-Hill. 833쪽. ISBN 978-0-07-171672-7. 4 January 2014에 보존된 문서. ↑ McGee, J; Covens, A (2013). 〈Gestational Trophoblastic Disease〉. Lentz, GM; Lobo, RA; Gershenson, DM; Katz, VL. 《Comprehensive Gynecology》 6판. Mosby. ISBN 978-0-323-06986-1. ↑ “Survival by stage of endometrial cancer”. American Cancer Society. 2014년 3월 2일. 2014년 6월 10일에 확인함. ↑ 가 나 Nicolaije, KA; Ezendam, NP; Vos, MC; Boll, D; Pijnenborg, JM; Kruitwagen, RF; Lybeert, ML; van de Poll-Franse, LV (2013). “Follow-up practice in endometrial cancer and the association with patient and hospital characteristics: A study from the population-based PROFILES registry”. 《Gynecologic Oncology》 129 (2): 324–331. PMID 23435365. doi:10.1016/j.ygyno.2013.02.018. ↑ Kurra, V; Krajewski, KM; Jagannathan, J; Giardino, A; Berlin, S; Ramaiya, N (2013). “Typical and atypical metastatic sites of recurrent endometrial carcinoma”. 《Cancer Imaging》 13: 113–22. PMC 3613792. PMID 23545091. doi:10.1102/1470-7330.2013.0011. ↑ Carlisle, Daloni (2014년 9월 21일). “Womb cancer: the most common diagnosis you've never heard of”. The Guardian. 2014년 9월 29일에 확인함.